Location: The Cerro Covadonga Project is located approximately 40 Km North of the Cerro Vanguardia gold mine, operated by Anglo American in the center of the Deseado Massif. Project Operator: Magna Terra Minerals has 100% control, through a leasing agreement with a private individual, of the Cerro Covadonga M.D. Property Information: This constitutes 2,945 hectares on which the project is based. The area of interest occurs in the western side of the Cerro Covadoga M.D. The zones discovered form a 3km strike length which we interpret to be a major dilatational jog. Geology: This project is at an early stage of exploration and has been characterized by Au bearing, low sulphidation veins and breccias, hosted in andesitic flows and rhyolitic tuffs of the Bajo Pobre and Chon Aike Formations. Most of the surface gold is concentrated in the discovery vein, Lomo Vetado and Trincheras Zones. Epithermal veins, stringers and breccias form an Au bearing footprint of 600m by 150m. A significant mineralized footprint from rock chip samples with anomalous Au, Lead (Pb), Arsenic (As) and Mercury (Hg) over a 3 km strike length in veins and hydrothermal breccias has been exhibited. Trenching has revealed low level Au with a very high correlation coefficient to Pb in argillic alteration in volcanic. The alteration, mineralization and geochemistry infer project outcrops are at or near the top of a low sulphidation gold-silver system. Work completed in 2017 include a 700+ soil sample campaign which covered “Lomo Vetado Area”, the “Cerro Redondo Area and the recessive ground in between. 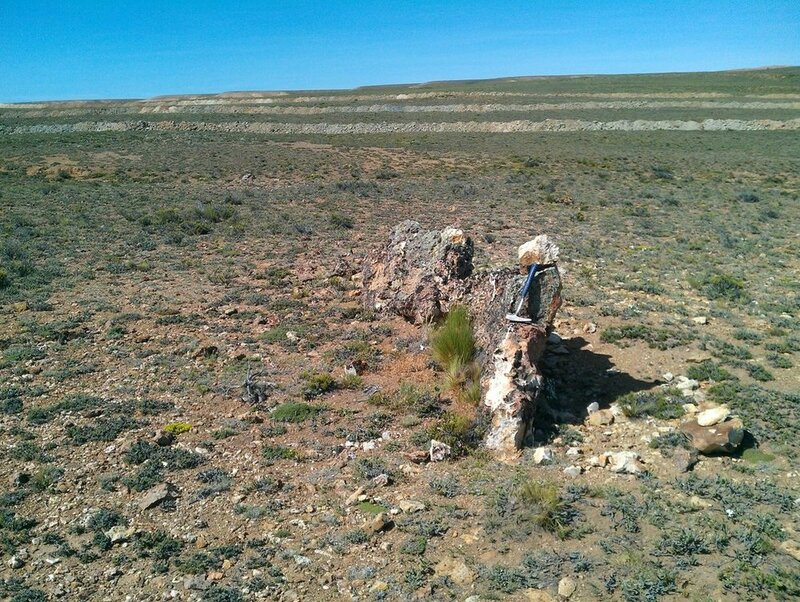 Samples were taken on a 50 m grid and are intended to map the geochemical footprint and support the orientation of the ground magnetic survey comprised of two blocks 1.5 x 2 km and 1.5 x 1.7 km. Lines were east-west with 100 m separation. The IP pole-dipole survey with 25 m dipoles, provided coverage down to 100 m depth. illustrates a reduced to the pole magnetic map overlain by gold in soil, equal to or greater than 6 ppb, which is 3 times the detection limit. The gold is shown relative to the positions of the IP lines and surface veins as well as the medium and high priority proposed drill collars. The orientation of veins varies significantly, but generally ranges from north-northwest to west-northwest. Covadonga is drill ready, and the Company has designed a preliminary drill plan of 19 holes totalling 2400 metres to test first priority targets.